The writing of history can be a sensitive matter. Particularly when writing the history of a people that primarily have an oral, rather than written, record of their past. But, to those that are interested, we are glad to provide some overview of how the current situation came to be. "The Crow Creek Sioux Tribe is a constituent band of the Great Sioux Nation, and a signatory of the Fort Laramie Treaties of 1851 and 1868. The Tribe resides of its 258,361 acre reservation in central South Dakota. The Missouri River overlies the western boundary of the reservation, and the resources of the Missouri's bottom-lands traditionally provided food,, water, wood for shelter and fuel, forage for cattle and wildlife, and plants utilized for a variety of purposes. In 1944, Congress authorized implementation of the Pick-Sloan Plan as part of the Flood Control Act of that year. The Pick-Sloan Plan was a joint program designed by the US Army Corps of Engineers and the Bureau of Reclamation to develop the water resources of the Missouri River Basin...in addition to flood control, these dams were designed to provide the benefits of hydroelectric power, navigation, recreation, and improved water supplies." "The Crow Creek Sioux Tribe lost 9,154 acres of precious bottom-land to the Fort Randall project, over one-third of which was forested. Eighty-four families, representing approximately 34 percent of the reservation population, were forced to evacuate their riverside homes and to accept land ill suited for houses, ranches, or farms. Fort Thompson, the reservation's largest community, was completely inundated." "For those unfamiliar with Sioux culture and the geography of the Dakotas, it is perhaps difficult to appreciate how important the bottom-lands were to the way of life of the Crow Creek people. Trees along the river had provided them with their primary source of fuel and lumber. The wooded areas also protected tribal members and their livestock from the ravages of winter blizzards and scorching summer heart. The gathering and selling of wood helped supplement their small cash income. The flooding of the forestland destroyed the vast majority of timber on the reservation. The gathering and preserving of wild fruits and vegetables was a traditional part of the culture of the Crow Creek Sioux. Wild plants added variety and bulk to their diet and were also used for ceremonial and medicinal purposes. The wooded bottom-lands served likewise as a shelter and feeding ground for many kinds of wildlife. Destruction of this environment by the Pick-Sloan dams reduced the wild game and plant supply on the reservation by 73%." "In 1962, Congress enacted Public Law 87-735, which authorized a payment of approximately $4.4 millinion to the crow Creek Sioux Tribe for damages sustained from the Big Bend project and for rehabilitation of the reservation." "The new community infrastructure proved so inadequate that many families decided to resettle instead in the Crow Creek district of the reservation, approximately 20 miles southeast of Fort Thompson." "The hospital at Fort Thompson was never replaced and the Indian Health Service did not bring a facility back to the reservation until 1980. The Corps of Engineers built a new Tribal Hall. However, it lacked the auditorium and gymnasium specifically provided for in the Big Bend Settlement Act." "Tribal elders who experienced the relocation recall that teh cookie-cutter replacement homes were not insulated sufficiently to endure the rigos of harsh Dakota winters. However, they were not reinsulated until 20 years later... While the replacement homes allowed many tribal members to have their first experience with electricity and running water, their cash income was such that they were not prepared for the monthly payments that accompanied these new luxuries. Many assumed that electrical and water supply lines would be free benefits of he dam projects to which they gave up their former homes." The Crow Creek Sioux Indian Reservation, home of the Crow Creek Sioux Tribe, is approximately 358,000 acres with a land base of approximately 10 x 70 miles located in central South Dakota along the northern and eastern shores of the Missouri River. Of the total land base, approximately 270,000 acres is reservation tribal land within Buffalo, Hughes, and Hyde Counties. Another approximate 108,000 acres is held in trust by the United States government. The terrain consists of plains, hills, shoreline, bluffs, prairie, lakes, dams, rivers, and creeks. Tribal administration headquarters, businesses, and the largest concentration of population are located in the town of Fort Thompson, which is approximately 60 miles southeast of the state capitol, Pierre. The Crow Creek Reservation is organized in three defined district areas: Fort Thompson, Crow Creek, and Big Bend. Because the Dakota who settled on Crow Creek Reservation are descendants of all bands of the Oceti Sakowi (Seven Council Fires) or the Dakota/Nakota/Lakota Nation (Great Sioux Nation) they most naturally called themselves Hunkpati (Making of Relatives, To Live). The Hunkpati are identified as a distinct band with signature authority on the 1868 Fort Laramie Treaty with the United States Government. The Crow Creek Sioux lost over 16,700 acres of land under the Pick-Sloan Act. The building of the Oahe, Big Bend and Fort Randall dams on the Missouri River had the most devastating and immediate effects on the Crow Creek Sioux’s subsistence, economy, food, geographical landscape, and natural resources. The Dakota on the Crow Creek Reservation voted not to approve of the Indian Reorganization Act of 1934 and were not formally organized until ordered to adopt a Constitution and By-Laws by the Secretary of Interior in 1949 to govern and manage tribal affairs. The Crow Creek Sioux Tribal Council is the official governing body of and for the Crow Creek Sioux Tribe. The Tribal Council, which consists of a Tribal Chairman elected at large and six Council Members, is empowered and authorized to enact resolutions and ordinances governing the management of all economic and educational affairs and enterprises of the Tribe and Reservation. The council also has authority to appoint committees and boards and hire department staff to assist in the day-to-day administration of services of the Tribe and Reservation. The following is an overview of the History of the Crow Creek Reservation, as stated in DWM's Work Packet. The writing of history can be a sensitive matter. Particularly when writing the history of a people that primarily have an oral, rather than written, record of their past. An in-depth account will not be given here. However, many of the more important events and occurrences will be accounted here so you can get a better idea of how the current situation came to be. Throughout history people have inhabited the shores of the Missouri River. Earth lodge villages of Arikara tribes lined the bluffs along the river in this area in the 18th century. The Arikara were gradually displaced by the more nomadic Lakota people. It is this mix of Arikara villages and Lakota encampments that the Lewis and Clark expedition encountered upon reaching this region on September 19th, 1804. Their journals are filled with vivid descriptions of the area and its inhabitants. During the first part of the 19th century, the history of this area was one of exploration and trading by European traders and explorers. Trading posts and military forts were soon established as non-Indian people began arriving by steamboat up the Missouri River. In 1863 the United States government established Fort Thompson eight miles upstream of the small tributary stream called Crow Creek. Fort Thompson was one of several military forts built in this region at that time. Fort Thompson was named for Clark W. Thompson, the fort’s first superintendent. Fort Thompson also served as the headquarters for the Crow Creek Agency. The Crow Creek Agency was created as a “repository” for American Indians in the aftermath of the Dakota-United States Conflict of 1862 in the neighboring State of Minnesota. A dedicated Christian missionary, Mr. John P. Williamson accompanied the Santee Dakotas on their steamboat trip up the Missouri River to the Crow Creek Agency. Mr. Williamson gave this account of the trip, “As they look on their native hills for the last time, a dark cloud is crushing their hearts. Down they go to St. Louis thence up the Missouri to Crow Creek. But this brings little relief… The shock, the anxiety, the confinement, the pitiable diet, were naturally followed by sickness…Thirteen hundred Indians were crowded like slaves on the boiler and hurricane decks of a single boat, and fed musty hardtack and briny pork, which they had not half a chance to cook, diseases were bred which made a fearful havoc during the hot months, and the thirteen hundred souls that were landed at Crow Creek on June 1st, 1863, decreased to one thousand. Much rich history is associated with this area and the people who live here. What is written here only “scratches the surface”. “History” though is not just a classroom subject taught in school. Here it is a very important part of the daily culture of the people. 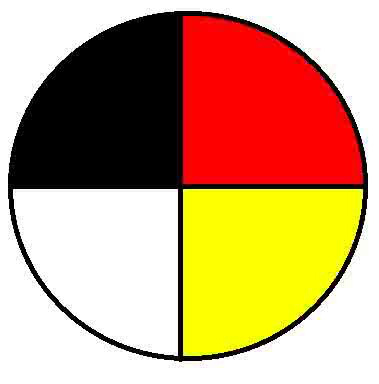 This circle appears often in the Dakota Sioux culture where it is commonly seen as the sacred hoop or medicine wheel. This symbol often reflects the personal goal of having a balanced and fulfilling life. Although each color of the medicine wheel has many meanings, one common interpretation is that each color represents an aspect of one's health. The green circle: (look closely, it is actually a turtle!) represents an abundant life! Four eagle feathers represent stages of life as a child, youth adult, and elder. The medicine wheel signifies good holistic (spiritual, mental, emotional, and physical) health. The cross of course is symbolic of God's son, mankind's wanikiya (savior), Jesus Christ! In it's entirety, this design then simply testifies that everything needed for life, an abundant and full life, now and eternally, is found in and through God's son, Jesus Christ!